At the time of our relocation (May 2010), we owned two vehicles - a Honda CRV and a Lexus LS400. The Honda was the workhorse and the commute car while the other was mainly driven around the island. They both served us really well with minimal maintenance though the Lexus had quite a thirst for higher grade fuel. 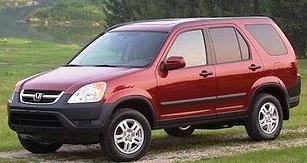 In fact, when considering options for a vehicle after relocation, the first choice was for a vehicle along the lines of the Honda CRV. Alas! SUVs command a huge premium in India. 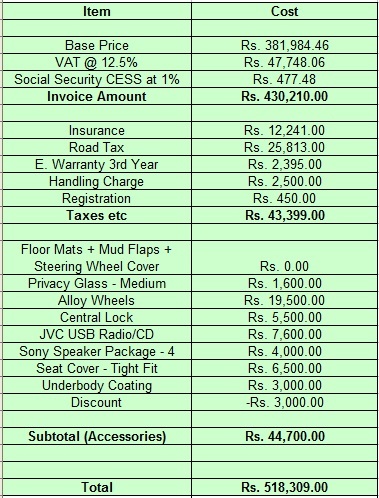 The Honda CRV we purchased new for $21K in the US is almost at triple cost ($55K) in India. Given this huge pricing discrepancy, we steered clear of the higher-end vehicles. The only vehicle with comparable US pricing was the Toyota Innova, a popular minivan that can be had for around Rs 12L ($27K). We decided against it for we were never been big fans of minivans and the extra-room to accommodate eight people would be largely wasted on us, a family of four. The type of transmission is definitely an issue to be addressed when buying a car. If one’s driving experience is mostly in the US, it is only natural to be comfortable with auto-transmission. By the early 2000s, automatic vehicles had become the norm in the US so much so that we were asked to wait a week or so, if we needed the stick-shift variant of our Honda CRV. For those in this situation, it is worth knowing that there are only very few choices in the small car hatchback segment with automatic transmission – the automatic variant of Hyundai I10 is fairly popular for around Rs 5L. Choices are aplenty in the sedan and higher segments for automatic cars in India. They are generally priced about Rs 75K more compared to the stick-shift version. Fortunately, we did not have to sweat over the transmission type. After we were set on the vehicle the dealer had in stock, the rest of the process went very smooth – we had to provide ID proof and proof of residence and the vehicle was ready the next day. A minor glitch was the goof-up by the RTO office whereby the Date of Delivery and Registration was off by a month – it took a month to correct it. 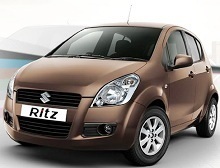 Maruti offers a number of rebates for certain car models which we were not able to cash in on. With a little flexibility, one should be able to avail a rebate in the 10K to 30K range - festive offers are usually higher. Of the optional equipment we purchased, the only thing we sort of regret is going for alloy wheels for Rs 20K. For it was not an upgrade – rather, they gave us the old wheels and installed the alloy wheels in the vehicle – we ended up giving the original 5 wheels back to the dealer for free (in hindsight, this was a mistake - one could easily sell it back in the after-market for a good price). Also, we did not know at the time of purchase the availability of a 4th year extended warranty – we ended up going for this just before our first year anniversary at a slightly higher cost (Rs 3349 vs Rs 2800) compared to purchasing that option at the time of vehicle purchase. The ownership experience during our first year was stellar and since then has been fairly satisfactory - however, the Indus service level has gone down and pricing has gone up substantially in the last four years. Highway mileage is outstanding at around 17.5 kmpl and falls to around 13 kmpl for city traffic. We have had no complaints to speak of so far – a few minor issues were handled satisfactorily by the dealership. The first free-service was totally free – we chose to add additional floor matting for Rs 1750. The second service (6-months) came to Rs 650 for Wheel Balancing and Alignment. The third service (12-months) came to Rs 1900 Engine Oil/Filter change, Wheel Balancing and Alignment, and Smog Check certificate. The several nicks we had in the first few months were handled transparently by the Indus dealer and the Maruti affiliated insurance, Royal Sundaram (Rs 500 deductible per incident). HDFC Insurance called us a month before the car insurance expired offering to renew our insurance at Rs 8200. On double-checking with the Indus dealer, it was made clear to us that the insurance offered is not cashless – claims have to be paid upfront and a claim made to the insurance company. Royal Sundaram’s renewal offer was quite a bit more expensive at Rs 9966, but we decided to go with that anyway – they offered a couple of customer loyalty coupons (Rs 500 each) as a Thank You for the renewal. Curious what the ID proof and address proof docs are for a PIO or OCI ? Also do they expect you to have an Indian Driving License at the time of purchase ?